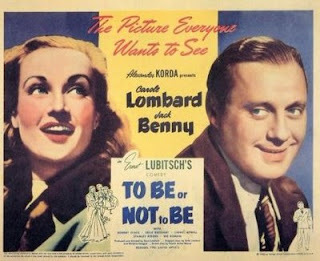 TO BE OR NOT TO BE was the inimitable Carole Lombard's last film. (I'm using that word a lot lately, Lombard was married to Clark Gable at the time, so they were 'inimitable' together.) Tragically, she was killed that year - at the age of 34 - in a plane crash while out doing her bit for the war effort. This last performance of hers is especially bittersweet, personally touching and yet hilarious. A wonderfully rich performance to remember her by. And who knew Jack Benny (until I saw this film I never realized he'd even BEEN an actor) could be this good in a movie? He plays a Pole with an American accent, but nobody's perfect - his timing, his execution is perfection. He is hilarious (and so is Lombard and the rest of the cast) in a film in which the underlying theme is the horror of war. 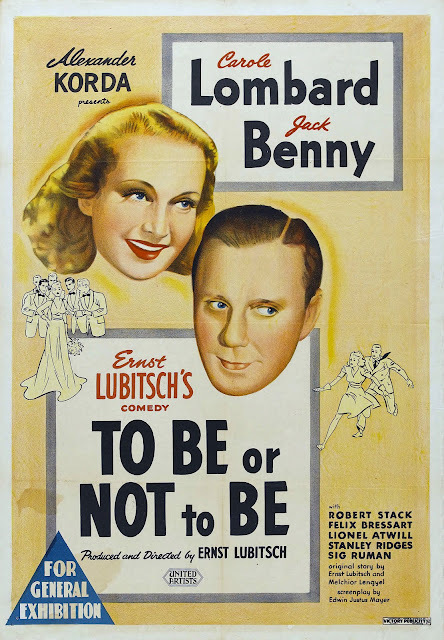 TO BE OR NOT TO BE, directed by the great Ernst Lubitsch, is set in 1939 Poland. 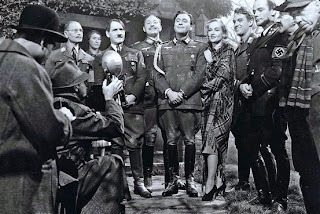 The tricky plot concerns a troupe of actors, headed by Josef Tura (Benny), which puts on nightly performances of Shakespeare and other classics even as the Nazis mass on the border. The running gag and reason for the title, is this: every evening Tura does excerpts from Hamlet (!?) and as he begins the "to be or not to be" soliloquy he is always interrupted mid-phrase by a member of the audience, usually a young airman or soldier, excusing himself and making his way out of his seat and up the aisle. What Tura doesn't know, but later begins to suspect, is that the flyer (played by a very young Robert Stack) is on his way to his wife Maria's - played by Carole Lombard - dressing room. Not that there's much going on in that dressing room except plenty of flirting, a bit of hand holding and a hug or two. Still, how dare this young upstart disrupt Tura's soliloquy? The pained looks on Benny's face as this continues to happen over and over are hilarious. And Lombard is wonderful as a flirtatious wife who will carry said flirtations only so far but has a great deal of fun in the meantime. Once Hitler's troops cross the border and the invasion is under way, the theater is shut down and everyone is thrown out of work. Almost immediately there are Nazis everywhere, as the Polish government falls and the populace tries to adjust. The character of Robert Stack is part of a Polish flying squadron which is soon on its way back to England to reconnoitre. Once in England, Stack and his fellow flyers meet a respected Polish professor named Siletsky. This guy has ingratiated himself into the confidence of the English and is on his way back to Poland on a mission involving his work with the Resistance. The soldiers innocently give the professor names of friends and family members to contact in Poland, most of them part of the underground. Siletsky is not only to happy to make a list of the names, he reassures the men he will contact them all and make sure they are well. Of course, it is almost immediately apparent that Siletsky is a traitor heading back to Poland to help the Nazi cause. Once the English realize it, just hours after the professor's plane has taken off, they send a volunteer - Robert Stack - on a following plane, to land in Poland, contact the resistance if possible, find the professor and kill him. From here on in you have to see the film to follow all the convolutions and plot points which, if I tried to explain them would only make your head spin. Suffice to say that Stack makes it back to Poland and winds up being hidden by the Turas in their little apartment. The actors group together, round up the professor inside their old theater and he is killed. Maria Tura gets picked up by the Gestapo. Jack Benny must then impersonate professor Siletsky (the Nazis don't know he's dead) - oh didn't I mention that Benny and the professor look enough alike to be brothers? - in order to save Maria. The Nazis, at first, are fooled. The scene in the Gestapo commandant's office is so darkly funny. Tura, pretending to be Siletxky (are you following me here? ), flatters the commandant (Sig Ruman) by revealing that he, Earhart, is known in certain important circles, as Concentration Camp Earhart. Tricky business, yes, but it truly is funny in context because Earhart is such an incompetent buffoon and Benny with a kind of steely good humor, makes it all work. It is farce, after all. 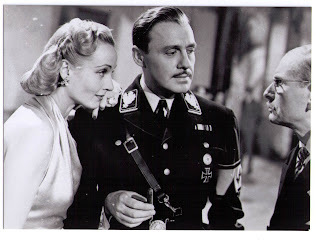 Once Tura's ruse begins to unravel (a very funny scene that involves a great deal of chutzpah, a fake beard and a mustache), the rest of the actors show up, all playing various Nazi types, the plot thickens and, hunted by the real Nazis, the group must flee Poland. It's all madness heaped upon hilarious madness, with some moments of seriousness thrown in. (Shylock's famous speech from Shakespeare's The Merchant of Venice, spoken by Felix Bressart as Greenberg, one of the few Jews in the troupe "...if you tickle us, do we not laugh? If you poison us do we not die? If you wrong us, do we not revenge? The speech is meant to purchase time for an escape.) 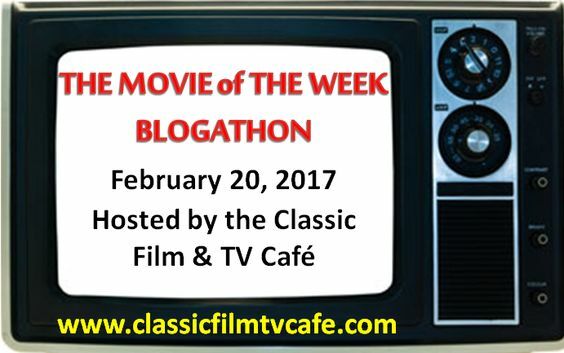 The actual FINAL escape of Tura, his wife and their band of merry men takes place later as they use Bronski, a fellow actor (played by Tom Dugan) with a remarkable resemblance to Hitler, to help commandeer a plane. As I said, it's all madness. A madness that didn't go over well with the 1942 audience. But the film is now, pretty much, considered a comedy classic. The film, in color, is pretty good, though the funniest bit comes in the first reel and nothing much that happens later touches the hilarity of Brooks and Bancroft singing SWEET GEORGIA BROWN in Polish. Though as I said, the film works well for Mel and his cohorts. We brought my thirteen year old daughter (at the time) to see it and she loved it. We had a great time. But I consider the Jack Benny the true classic version. If you see them both, side by side, I should imagine you'd know what I mean. Benny's version has a special quality that the Brooks version lacks. Though the Brooks film is, of course, more manic. (I wish he'd filmed it in black and white.) "Is this England??" It's indeed a black comedy classic. But one of those films, like Chaplin's The Great Dictator, that one can't imagine someone making after the West learned about the full extent of the Holocaust. Robin: Mel Brooks, who is himself Jewish did the remake in 1983. He believes that laughter is the only antidote to evil. He talked about this when working on his B'way version of THE PRODUCERS. This show has some scenes featuring Nazi soldiers dancing to a sprightly tune called SPRINGTIME FOR HITLER. I do understand what you mean, Robin. Yes it is black comedy. But don't you think there is a way to laugh while at the same time still feeling the horror of it? I saw that movie, Jack Benny is great. Now Springtime for Hitler was a scream..I just saw part of Chaplin's Great Dictator this afternoon. He really was a talent and so cute. I did see Mel Brooks' version of this movie, and thought it was funny. He is funny. I've seen him in so many skits, and even on YouTube. And I've seen him on tv, telling jokes. 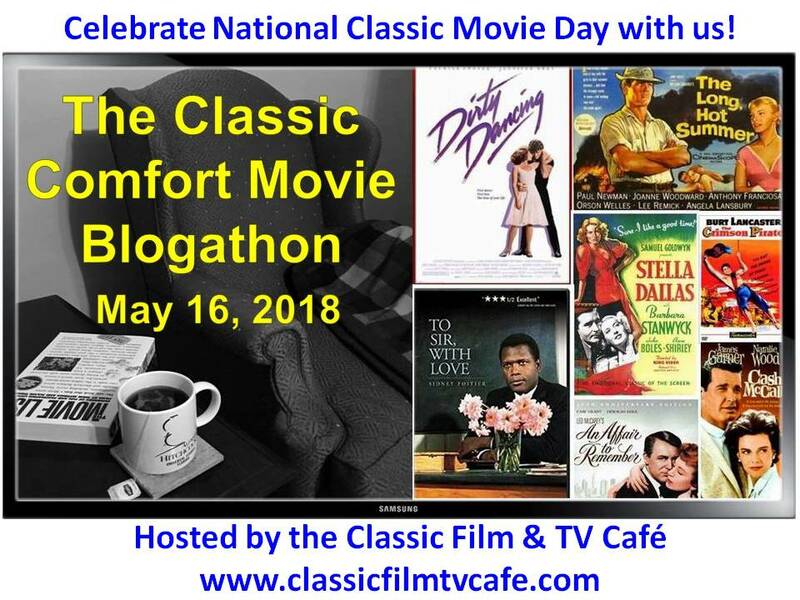 One program that is hilarious was with Brooks, Sid Caesar, Carl Reiner, and others comedians and comedy writers, talking about the old days of working together. It is out on dvd. I should see this movie at some point. I try to avoid WWII as a backdrop to books or movies, and Poland, too, which is where my Jewish side of the family is from. It's hard to laugh knowing what happened. But Brooks can do it, especially since he is Jewish. I'm more a Trouble in Paradise man myself. I remember reading a piece by Francois Truffaut where he went into rhapsodies about the translucence of Lombard's dress in this film. She is great in this one, so witty and self-assured. I am really enjoying your classic film posts. I've not seen this and must look it up. Yvonne: I was never a big fan of Chaplin. I just couldn't apopreciate him properly. More my failing, than his, I think. After seeing this film, I was surprised that Benny didn't go on to have as big a film career as Bob Hope. Maybe he was a little too unique to fit the mold of many scripts. Who knows? He was great on tv later with Rochester. Kathy: I love Mel Brooks MOST of the time. He can get carried away, though. "It's good to be the king." Good line, awful movie. When I was a kid, every Saturday Night it was YOUR SHOW OF SHOWS with Sid Caesar, Carl Reiner, Imogene Coca and Howard Morris. There's NEVER been anything funnier on television, there probably never will be. We used to roll around in fits of laughter. Kathy, Ernst Lubitsch who directed the orignal TO BE OR NOT TO BE was Jewish - his mother was Jewish. He was the son of Russian immigrants born in Berlin but came to this country in the 20's. Peter: You are entitled to like whatever you like, m'dear. I love Edward Everett Horton in anything. But Herbert Marshall? I think not. I'm also not crazy about the dark haired woman in the film. She was always so 'ON' - so overly dramatic. I always thought she would be perfect for the Marx Brothers. They would humanize her. Ha! Thanks for dropping by and posting, kiddo. Oh, also, 'George Washington Slept Here' is another great Benny film! It has a similar story to 'Mr. Blandings Builds His Dream House'. Nicolas, the whole idea of Stack as a Polish flyer with his American accent is funny on its face. Though maybe he was supposed to be an American? Can't remember. There's something about this film that is wierdly....well, wierd. But I've never been able to place it. Maybe it's as Robin says, my own knowledge of what came after. And yet I find it funny. Not fall down on the floor funny, but funny just the same. I think it's because I love the polish (as in polishing furniture) of it all and the obvious fun the actors were having. Lombard especially. And, of course, I love the whole idea of outwitting the Nazis. Though in the end, when Benny and the gang get away, the awfulness is still there, left behind, still happening in Europe. And it would keep happening for another three dreadful years. Nicolas: GEORGE WASHINGTON SLEPT HERE? I've never heard of it, much less seen it. Though it does stir something in the back of beyond of my memory. I am definitely going to check this film out. I love Jack Benny. Thanks for the tip! Yes! Show of Shows was absolutely hilarious. I watched it then as a child, too, and we laughed, too. My father loved Sid Caesar and his gang, all of them. Now, whenever I see a clip (as Sid Caesar doing double-talk or a fake German monologue as a doorperson), I laugh so hard. But this dvd of that group and the writers revisits the old days, and I have laughed so hard when I watch. Some of the episodes they discuss about those days are nuts and hilarious. And I must give the zany, brilliant Imogene Coca her due also. She could just do a facial expression and we would crack up. Imogene Coca was the perfect 'foil' for Sid and the gang. She NEVER (well, hardly ever) broke up laughing no matter what they did. She was wonderful!! I wonder if "Your Show of Shows" is available on DVD. I once said that "Trouble in Paradise" was the closest thing to a perfect movie I'd seen. Then I watched it again, and I thought Miriam Hopkins overacted just a bit in one scene in which she has the camera to herself. Still, it's one of my favorites ever. Peter: I wonder if we'd laugh half so hard now. Though funny is funny, there was just something about YOUR SHOW OF SHOWS - frentic madness? - that might not work as well today. If they're not available, they soon will be, that's for sure. Soon enough, EVERYTHING anyone ever did will be available for viewing. Ha! Herbert Marshall and that black haired woman in the cast are BIG stumbling blocks for me, Peter. But maybe, because of your enthusiasm, I might take a look one of these days. 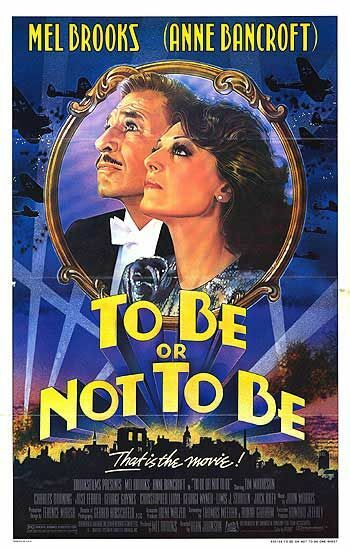 I was underwhelmed by "To Be or Not to Be" the one time I've seen it, but I definitely ought to watch it again. I haven't seem much of Carole Lombard, though she was very good in "Mr. amd Mrs. Smith," not one of Hitchcock's best movies. Peter, you are determined to be the fly in the ointment, aren't you? HA! Different strokes for different folks, as the old saying goes. Carole Lombard was the queen of screwball comedy, par excellence. Not only that, she was beautiful and totally content with it. Favorite Lombard films: TO BE OR NOT TO BE and TWENTIETH CENTURY in which she parodied herself. Also NOTHING SACRED and the one in which William Powell played her butler, forgot the title. She was superb. I love Lubitsch's version of TBONTB. but I haven't seen Brooks'. I will have to watch it soon to compare with the original. Michael: The Mel Brooks version is actually pretty good. But it's a 'pretty good imitation' if you know what I mean. But still a fun film. Who didn't fall in love with Carole Lombard? She was spectacular. I loved her too in TWENTIETH CENTURY with John Barrymore. Hilarious. It's a great movie though I did in fact see the remake first and as I've always had a crush on Bancroft I have a real soft-spot for it too - great choice Yvette, I just have to drop everything and watch it again this weekend - thanks! Legendary Actress Jane Russell Has Died. Fun Stuff: Cartoonist/Illustrator George Booth. A stylish 'STYLISH' Award for Yours Truly. Fashion Week - Just a peek. Brian Jacques, creator of REDWALL, has died. Sunday Salon: Three Books to keep an eye on. Good day for a Poem. This is what it feels like today. 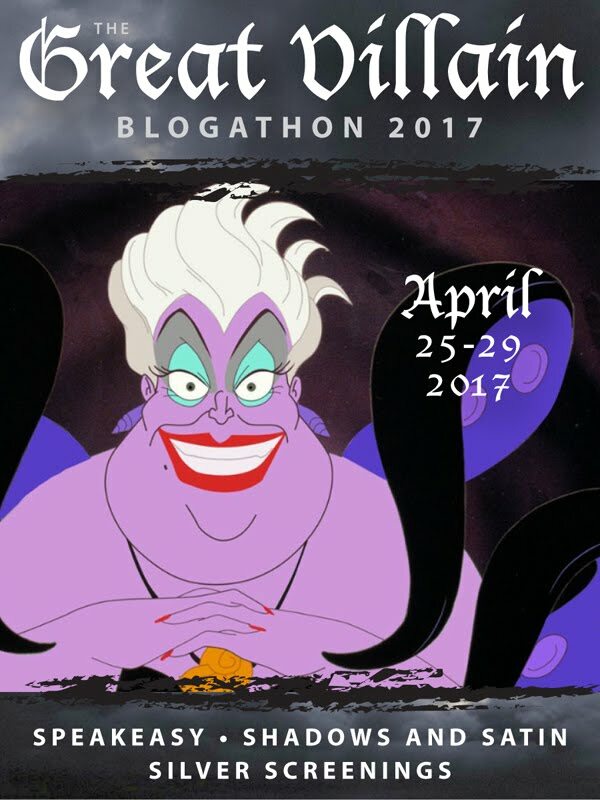 This is I Love to Read Month!